Happy Monday! How was your weekend? Other than soccer and ballet lessons Saturday morning we had a pretty low key weekend. I do have to say Sasha scored three goals, prevented one goal by catching it basically in her stomach, and she chose one of the bigger/faster boys to guard. She played so well. Too bad athletic talent doesn’t run in our family. We are still on the hunt for new living room furniture, no such luck. Last week weÂ received eight inches of snow with more predicted today. Yay! 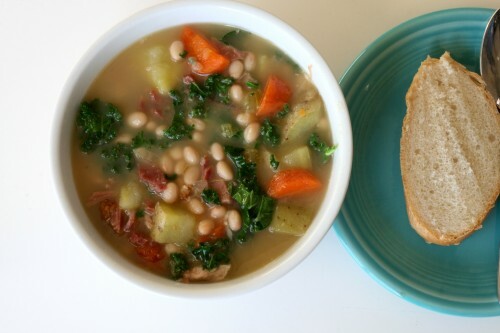 Snow days are perfect for a hearty bowl of soup and a warm piece of buttery bread. I bought a large spiral cut ham on a whim (it was a great price) and needed a way to use some of it up. I immediately thought soup, ham + bean seem so classic.Â I added some extra veggies to the soup to give it a little more oomph. If you don’t have a ham sitting round needing to be used up look at the meat counter at your local supermarket for a ham hock. It adds such a great smokey flavor to the soup. Cozy up to a bowl of this soup and it will take the chill off from the cold weather. Use caution when using ham. It can be a tad salty! I recommend using unsalted chicken stock (Kitchen Basics makes a great boxed stock). Feel free to use dry beans first soaking them overnight if you use canned beans give them a good rinse before adding them to the soup. Adding potatoes to the soup helps to overcome any saltiness you may encounter. In a large pot over high heat bring to boil the water/broth, carrots, celery, onion, garlic, potatoes and the ham bone. Once boiling turn heat down to medium low and partially cover the pot and simmer for an hour. The potatoes start to fall apart and the ham should be falling off the ham bone by this time. Remove the bone and pick all the ham bits off and place them back in the soup. 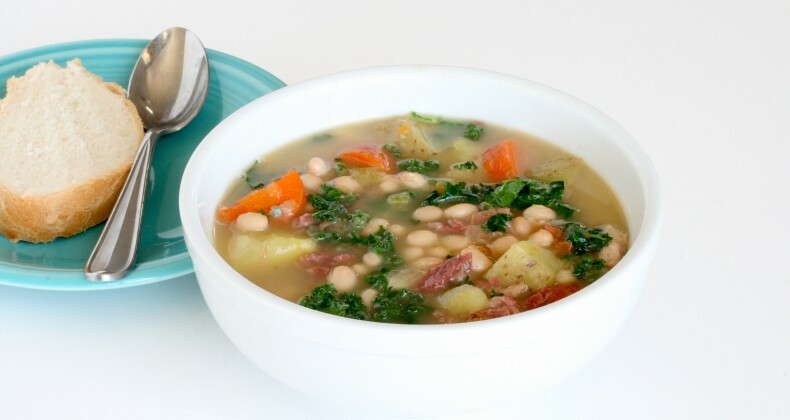 Add beans and kale to the simmering soup. Simmer for 10 more minutes or until the kale has softened. Add more water or chicken broth if the soup needs it. Serve with a warm buttery piece of bread. Enjoy! Way to go Sasha! Soup looks really good too.